fixes advertisement signs to buildings by means of screws, bolts, etc. 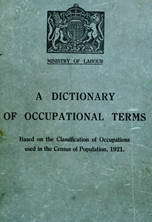 ; usually a carpenter (474) q.v. keeps, feeds and takes care of animals; may keep a private establishment for care of dogs, cats, horses, etc., or assist in a menagerie or zoological garden. attends to, feeds and has care of a collection of fish, aquatic plants and animals; keeps water in tanks or other vessels renewed; generally a uniformed official who patrols aquarium and sometimes acts as guide to visitors; cf. aquarium labourer (970). assembles bones and skeletons; drills holes for wire, with hand or machine drill and secures them at joints by means of wire and pliers; gives final polish to bones with scalpel and steel one scrapers. restores to original condition any objects of art, e.g. pictures, see picture restorer. covers artists' canvas with one or more coats of a priming paint, using special brushes and paints to produce the kind of surface required. looks after goods before, during, and after auction sale; collects purchase money from buyers taking immediate possession of goods; sometimes performs the duties of broker's bailiff q.v. digs in sand on sea shore at ebb-tide for "lug" worms, used by fishermen as bait. sticks or pastes posters for advertisement purposes on hoardings or other display station by means of a long-handled brush and paste. catches or ensnares wild singing or other birds by tethering a captive or decoy bird of the same species to the ground, near which is set a net trap; when decoy has attracted wild birds, pulls cord to release trap and so net the birds. assists distraining broker q.v. in executing distraints; remains on premises, i.e. in possession, until distraint is effected Or debt is paid. feeds, grooms and attends to calves in sheds on calf lymph vaccine farm; cleans calf sheds; straps down or holds down animal for doctor to take blood tests; usually a farm labourer (022) q.v. a kennelman q.v. who attends dogs at owners' homes. assembles and repairs broken china by sticking the pieces together with cement; may also drill holes with hand or machine drill on either side of crack or join and strengthen joint by cementing in brass rivets; usually also repairs glass articles. periodically visits public buildings, institutions, works, factories, etc., and winds clocks, cleans and polishes glass faces, makes minor adjustments to clocks according to contract; occasionally carries out minor repairs, cf. clock jobber (323). a keeper appointed by the local governing authority to guard a common, trees, animals, birds, etc., from damage or destruction by the public, and generally to enforce local bye-laws. scrutinises answers to newspaper or magazine competitions and reports to editor submitting winning entries for final adjudication. visits business premises and dwelling-houses in a prescribed area and compiles a list of names and addresses of occupiers according to trades or professions, etc., for editor; collects information for preface and brief description of town, borough, etc., giving details regarding population, local authorities, staple industries, etc. ; checks names and addresses for annual reissue of directory; solicits advertisements for advertisement pages. visits premises after a case of major infectious disease, e.g. scarlet fever, to disinfect bedroom, nurse's room, etc. ; sprays room with formaldehyde, using foot pump; removes bed and personal clothing for disinfection at local disinfecting station; usually an employee of local health authority. calls at private dwellings in poor quarters to collect weekly contributions due for medical attention received at dispensary; sometimes makes "follow up" reports to medical superintendent. carries out distraints for debt on goods, furniture, etc., under bill of sale or order of the Court; effects entry to debtor's premises, values and attaches furniture, etc., to cover amount of debt; instals and instructs resident bailiff or broker's man q.v. (iii) (waterworks) examines walls and floors of reservoirs and carries out such repairs as can be effected without emptying reservoir, e.g. cementing cracks, cleaning inlets and outlets of obstructions, etc. assists diver q.v. into, and adjusts diving dress; lowers him into water, holds life lines, and takes signals; turns wheel of air pump and controls air supply while diver is under water, by watching pressure gauge. is engaged in breeding various types of thoroughbred dogs as a business or profession; feeds and exercises dogs; nurses and gives medical attention to sick dogs. tests drains to discover possible leakage at joints or broken pipes, using either chemical smoke test or water test; renders report to local health authority and landlord. plants certain kinds of ferns in special glass case in fern soil for show purposes or transport; seals case with putty; usually done by nursery gardener' (013) q.v. filterman (sewage farm); opens and shuts valves of sprinkler to control flow of water to filters; occasionally sweeps channel round filter walls; periodically empties filter of cinders, cleans walls and bottom and fills with fresh cinders. makes periodic visits to buildings, etc., for purpose of cleaning and testing working efficiency of all fire extinguishing appliances; inspects and refits charge in patent fire extinguishers; examines hydrant, hose and nozzle and tests water pressure with pressure gauge; cleans and polishes all bright metal parts. is in charge of fire extinguishing apparatus in theatres, music halls, etc. ; makes periodic tests of all water hydrants; must be in attendance at all public performances and is responsible for keeping exits clear; may be directly responsible to local authorities issuing licences to theatre. breeds fish, especially trout and salmon, at hatcheries, farms, etc., for stocking rivers or for market; supervises work of fish hatchery assistants q.v. assists fish breeder q.v. keeping hatcheries in proper order, giving food to fish, netting adult fish, "stripping" eggs from female and adding "milt" from male fish in special tanks or ponds, netting small fry for removal and sale. guards fishing rights on estates and prevents unauthorised persons fishing or trespassing; sometimes attends sportsmen or fishing parties, providing bait, etc. ; may have combined duties of fish keeper and game keeper (910) q.v. greases and clears obstructions daily from iron flaps, fitted to sewer outlets to prevent entry of tidal wave. decorates ball rooms, tables, churches, etc., with flowers, ferns, palms, etc., in various designs or colour schemes for special functions. one of a crew in whale boat; rows in chase of whale; fires harpoon with explosive head from gun in bow of boat; pays out cable as whale dives; assists in flensing operations, working tackle or cutting blubber and whalebone from carcase with spade-like knives. slaughters horses by means of humane killer; removes dead horses to his yard; usually cuts up carcases for commercial purposes. usually a person with a specialised knowledge of two or more languages, including the spoken idiom, who acts as intermediary between those speaking different languages at law courts, international conferences, hotels, railway stations, etc. ; sometimes acts as courier (929) q.v. to travellers visiting foreign countries. feeds, administers medicine, cleans and takes general care of dogs, cats and other animals in kennels of veterinary surgeon. (ii) switches on and off public or works electric lights; cleans globes; renews carbons and generally adjusts or trims arc lamps; cf. arc lamp assistant (698). executes distraint, i.e. takes possession of goods, furniture, etc., on landlord's premises, remaining in possession until rent is paid; cf. broker's bailiff. regulates traffic, etc., in market; enforces byelaws; usually a uniformed official employee by local authority. has charge of market under local authorities; allots spaces to auctioneers, stall holders, etc. ; collects rents; is generally responsible for cleanliness, etc., of market, and enforcement of byelaws. feeds and attends to a collection of wild animals kept for exhibition purposes; sometimes travels with animals and exhibits them in country towns; cf. showman (883). assists mortuary keeper (921) q.v. in keeping premises clean and disinfected; assists in preparing bodies for burial and at postmortem examinations; carries bodies from and to mortuary on stretcher or in coffin. collects, mounts, buys and sells live or mounted specimens of birds, insects, fish, animals, trees, flowers, etc. ; often also studies their lives and habits. patrols park, prevents trespass, damage to plants and shrubs, or disorderly conduct; generally enforces observance of byelaws; usually a uniformed official employed by a local authority. rules line or makes other decoration, usually geometrical in form, round picture on mount with ink or wash colour. affixes pictures to suitable cardboard or gilt mounts preparatory to framing, usually with starch, paste, or other mountant, or by patent heated press process; may also frame pictures, cf. picture framer (485). repairs, restores and cleans old and dirty pictures; (oil paintings) removes old varnish by carefully applying spirit solvent on soft swab; retouches painted surface; backs by pasting or glueing on new canvas or board, torn or broken parts of picture; revarnishes; (watercolours, prints, etc.) removes stains with solvents, applied with swab or brush, and cleans with soft erasers; remounts; sometimes also frames picture, cf. picture framer (485). works out all possible or probable solutions of an advertisement newspaper or magazine competition and sells them through medium of advertisement to prospective competitors. patrols a forest or park, reporting on growth of plantations; prevents trespass and poaching; may shoot rabbits; sometimes collects rents of cottages on estate. adjusts and uses a recording machine in taking master records; superintends, from a technical point of view, band, musicians, singers (886) q.v. or other persons making record. tests accuracy of small arms by shooting therewith at target on rifle range; notes any adjustment necessary in sights; sometimes himself adjusts sights; returns rifle to works for other structural faults, e.g. in bore. erects staging, tripods, and other temporary lifting tackle with assistance of labourers for use of slinger q.v. ; is sometimes responsible for slinging of heavy machinery; cf. slinger. a member of fire brigade or other salvage corps; secures and removes goods, furniture, etc., from buildings, which have been burned by fire, or otherwise damaged; sometimes removes effects during progress of fire to save them from damage by fire, water, etc. makes up orders for, weighs and encloses in paper envelopes or boxes, flower, vegetable or farm seeds in seed room for seedsman (770) q.v. (ii) where seeds are sorted and cleaned by electrical machinery, hand picks sorted seeds spread on a bench to remove bad or discoloured seeds. fumigates ships with sulphur, charcoal, etc., fumes, for purifying vessels after infectious disease, or for destroying beetles, vermin, etc. ; seals outlets; prepares braziers for burning sulphur, charcoal or chemical compounds producing other vermin-destroying gas; opens outlets when process complete. fastens wire or rope sling round boilers, machinery, heavy articles or loads; attaches sling to hook on crane rope; gives directions to crane driver (950) q.v. by signalling with arm for lifting and transporting goods as required; unhooks sling; sometimes further designated, e.g. boiler slinger, sleeper mill slinger. adjusts chains and tackle to raise heavy ironwork and to sling it towards steam hammers in accordance with blacksmith's instructions; usually done by blacksmith's helper (279) q.v. visits business and private premises periodically to clean and swab with disinfecting fluid the mouthpieces and receivers of telephone instruments. drives a horse-drawn or petrol-driven machine brush up and down a road or street to sweep up dust, refuse, etc. ; usually employed by local authority. preserves and stuffs the skins of animals, birds, fish, reptiles, etc. ; removes skin from dead body with special knives, scissors, pliers, etc., taking care to preserve scales, feathers, hairs, etc., in natural state; rubs preservative solutions into the skin; makes body foundation or manikin by building up, on wire foundation or armature, with papier mache adhesive tape, etc., to give a natural attitude and to show as exactly as possible the form, muscles, etc. ; covers manikin with skin and with a special mountant causes it closely to adhere; finally dresses feathers, scales, etc., affixes eyes, teeth, claws, etc. : sometimes mounts specimen in case with representations of natural surroundings. clips off by hand with large scissors, the leaves or beard at base of teazle flower head; clips off stalk a few inches below flower head. cuts off top and base of flower head of large teazles used in hosiery trade, by holding by hand against two circular knives. sorts teazles according to size (12 sizes), throwing them into different boxes for packer (949) q.v. (ii) supervises the work of erection by labourers. patrols streets in neighbourhood of university; arrests students for specified misdemeanours; works under direction of Proctor, to whom all evidence is submitted. guards collection of articles, stuffed animals, or other valuable historical or interesting objects; prevents damage by the public; sometimes acts as guide to visitors; usually has care of keys and opens and closes museum at stated times. opens and closes sluice gates by which effluent from filters is distributed in irrigation system of sewage farm; inserts stops as required in water channels; greases sluice gates and keeps them and channels free from obstruction; often also works as farm labourer (024) q.v. guards, feeds, and tends animals, reptiles, birds, fish, insects, etc. ; cleans out cages and enclosures; prepares special food as required; under instructions administers medicine and tends sick animals in sanatorium.